His Whipping Boy is now available! As of this afternoon the novella is available through All Romance Ebooks, Smashwords, as well as direct from the publisher. Amazon Kindle and Barnes&Noble distribution will be available soon. Volume 3 turned out to be a bit of a monster, evolving into a 137,000 word novel from its birth as a 1-and-a-half-page plot outline. It's heavily plot-intensive, providing insights into several of the characters' pasts along with the mix of suspense, adventure, and sensuality that I've tried hard to instill in the House of Silence series. I can't wait to share it with all of you! Click here for more information about the soon-to-be-released Volume 3. 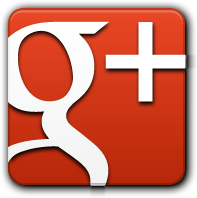 Click here for information about the House of Silence series. My new m/m fantasy novella His Whipping Boy is currently in production and will be available soon! I had such a fun time working on it, and I'm really excited to share the characters and the story with all of you. Click HERE for more information. So pretty! I'll post more information as soon as the story is available for purchase. Summary: Cedric de Breos was an average son from an average farmer's family before he was chosen--by royal decree--to befriend Alain Tomolia, the solemn and enigmatic crown prince of Dunn. As Cedric dutifully pursues their strange friendship, he begins to suspect that Alain is haunted by a dark secret, one which has its roots sunk deep in the crown prince's past. Cedric's situation is complicated by the gradual realization that his intended purpose is not only to serve as companion to the crown prince but also as his surrogate in the whipping yard, taking the punishment for Alain's misdeeds. Will Cedric find a way to come to terms with the resentment, pity, curiosity, and reluctant attraction he feels toward the crown prince, or will he allow the circumstances around them to command their fate? My anthology Entering the House of Silence is now available on Fantastic Fiction, Amazon Kindle, All Romance Ebooks, Barnes&Noble and Smashwords. It is also available in paperback. There has been a bit of confusion over the past couple of months about when the ebook version of the book was going to be available. Thank you to everyone for your patience while I was waiting to get the matter resolved. 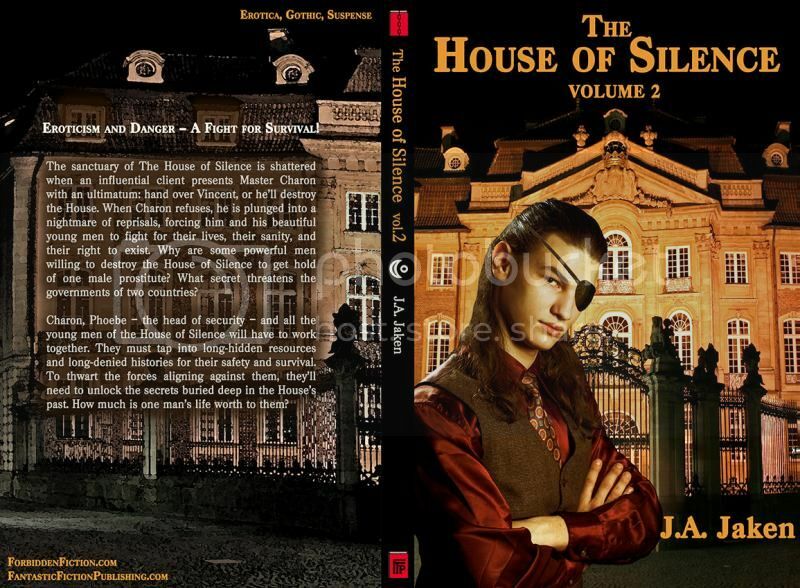 Click here for more information about the House of Silence series. The stories are available individually as well through Fantastic Fiction. The print edition of Entering the House of Silence is now available! Buy your copy of the paperback version HERE. The anthology is available in various ebook formats as well, and the individual stories are also available separately. Click here for more information! The individual stories will be available soon as well. The novel is also available in ebook format (epub, mobi, & pdf). Click here for more information! A new anthology of short stories from the universe of THE HOUSE OF SILENCE series is coming soon! I just received the finished cover from my publisher and am expecting the ebook proof for review any day now. The stories will be available both individually and as a collection, and there is a print version of the anthology in the works as well. I am really excited to share these stories with all of you!!! Click HERE for more information about the collection. I've also been hard at work writing Volume 3 in the series and am getting close to 60,000 words there. I'll post more updates as the novel gets closer to publication! I'm currently working on writing The House of Silence, Volume 3. I hit a writing high recently and managed to write about 20,000 new words just this past week. Whoo! It's all coming together really well, from the plot to the characters to all of the different subplots I'm weaving into it. Lots of red herrings and intrigue and just fun fun fun. ^_^ I'm really enjoying taking Charon and the boys out to play again, and seeing where their lives are leading them after the end of Volume 2. Nicholi's Vengeance is an All Romance Ebooks best seller!!!! I'm so excited and happy over the response that this novel has been getting. It was incredibly difficult and stressful for me to write at times, but I'm very happy with how it turned out. Thank you to all of you for your support and encouragement as I was writing this novel! Nicholi's Vengeance is now available! This was a very intense book for me to write, and I'm thrilled to finally share it with all of you. The print (paperback) edition of the novel will be available . Here it is! 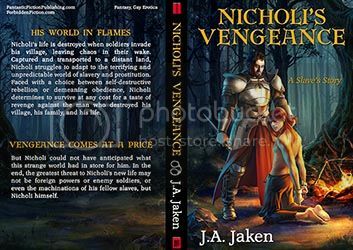 The cover for Nicholi's Vengeance is finally done. I'm extremely happy with how it turned out. The artist my publisher hired is incredibly talented, and managed to capture two of my main characters beautifully. I adore the colors, the forest setting, and the attention to detail, right down to the defiant expression on poor Nicholi's face. The novel is scheduled to be released by March 1st. Click here for more information! The print editions of The House of Silence Volume 1 and The House of Silence Volume 2 are now available! The covers are absolutely gorgeous. I'm really happy with how they turned out! Buy your copy of the paperback versions here: Volume 1 and Volume 2. The novels are also available in various ebook formats as well. Click the links above for more information about the books!